Concern over global warming peaked in 2007, but has dropped as an item of concern, including a five percent drop just in the last year (41% in 2007; 33% in 2009; down to 28% in 2010). There are many reasons for the drop, including a sense the environment has improved in recent years and a growing view that, while the economy is vulnerable, environmental protection is less important. In addition, global warming has become a polarizing political issue regularly attacked by talk radio and suffering from credibility issues due to controversies around the scientists and politicians who promote it. 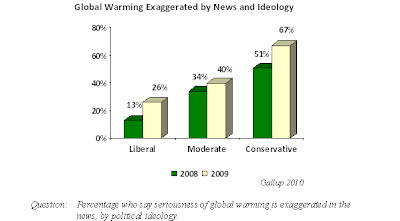 • The issue has taken on a political context, and conservatives and moderates are more inclined to say the news exaggerates the seriousness of global warming. • The credibility of global warming has even dropped with people who say they understand the issue very well and who claim to be active or sympathetic to the environmental movement. Andrew Romanoff, who needed to show grassroots support, won the caucus against U.S. Senator Michael Bennet. Romanoff, with little campaign financing, had more than half the caucus attendees, as shown in precinct straw polls conducted around the state. Bennet, with millions in the bank, spent profusely on direct mail and get-out-the-vote robocalls. Most of the top leadership of the party, including the president, endorsed him. President Obama even visited the state in February to assist him. But, in his first election outing lost. Romanoff must now translate the caucus support into more financing and momentum for the August 10 primary. In precinct caucus results with national implications, Ken Buck, Weld County district attorney, tied frontrunner former Lt. Gov. Jane Norton. “Analysts including Denver pollster Floyd Ciruli said Buck’s strong showing signals that the vocal group of conservative activists could affect Republican elections. Although former Congressman Scott McInnis won a solid majority of caucus goers, conservative activists Dan Mares did manage to get above the 30 percent threshold for ballot access. Unless conservative attendees switch before the spring convention, McInnis will have a primary. Although Americans strongly hold advanced developed countries’ attitudes toward the environment, including worry about global warming, the general perception that environmental conditions are improving, the deep recession and controversies surrounding global warming have reduced public concern about the environment. A recent Gallup poll records Americans are less concerned about top environmental problems from a year ago. The quality of drinking water consistently tends to be the public’s primary concern. Several polls conducted for Great Outdoors Colorado during the 1990s and 2000s confirm that water pollution is also the top worry in Colorado. This year, air pollution tends toward the middle of the list of concerns after being near the top concern in 1989. The decline reflects improvements in air quality, producing a lower salience in the news. There have been dramatic drops in many of the concerns since 1989. For example, worrying about pollution of rivers, lakes and reservoirs dropped from 72 percent in 1989 to 46 percent in 2010. 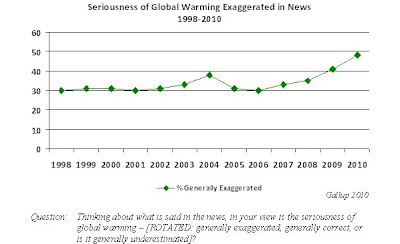 Heightened concern about global warming has been a more recent phenomena, reflecting the intense publicity (the Al Gore factor), but a 13 percent drop off since its peak in 2007 (41%) has been significant. The Denver Business Journal published our 2010 predictions as the new decade begins. Topics include: economy, national and Colorado politics, values, and communication technology. Change is accelerating and the oscillations are widening. The next decade will be a challenge for forecasters. Although it is unlikely the Democrats will lose 40 congressional seats in November, the number necessary for them to lose control of U.S. House of Representatives, Obama’s 50 percent average mid-term approval suggests a loss of at least 20 to 30 seats. But, there are other negative signs for Democrats, including high unemployment, low satisfaction with Congress and the direction of the economy, that suggest the party is on the edge of a major crisis. Obama’s and Democrats’ problem is mostly related to the health care debate and his effort to force a party vote. Obama’s strategist believes passing reform will be better than passing nothing. It’s not clear that judgment is correct. In general, presidents lose seats in mid-term elections. Clinton and G.W. Bush suffered losses sufficient to lose their U.S. House majorities in 1994 and 2006, respectively. Their average approval ratings were below 50 percent. Bush and Clinton both gained seats in one of their mid-term elections, but both had high average approval ratings at that point in their presidencies. Obama is on the cusp. Hence, vulnerable Democratic incumbent congressional and senate candidates are mostly on their own. As the Democratic congressional leadership and President Barack Obama attempt a final push on health care, an examination of the election results from the three statewide elections since November strongly suggests vulnerable Democratic congressional and senate incumbents are on their own. Even with prodigious effort, Obama was unable to reassembly his 2008 winning coalition. In particular, independent votes shifted to Republicans in big numbers. In New Jersey, Obama won 51 percent of independents in 2008, but Gov. Corzine only won 30 percent. In Virginia, Obama’s independent support dropped 16 points in the Deeds race. In Massachusetts, Democrat Martha Coakley saw a drop off in blue collar Democratic areas, such as Lowell of 18% and the smaller towns in central Massachusetts by similar percentages. Massachusetts held especially onerous news for Democrats because of the importance of the health care bill to the Democratic loss. It suggests that forcing a Democratic vote on health care may be the worst political decision since President G.W. Bush and Karl Rove believed the war strategy could not be changed and Republicans would hold the line with small losses in November of 2006. Colorado and Nevada are the most competitive state races out of nine western senate seats up in 2010. Other Democratic races being watched are in California, Oregon and Washington. 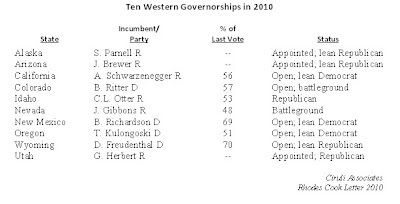 There are ten gubernatorial elections in western states this November. Colorado’s may be the most competitive, but there are eight seats that are either open (California, Colorado, New Mexico, Oregon and Wyoming) or have appointed incumbents (Alaska, Arizona, and Utah). A couple of recent Gallup polls show support for Israelis is at record highs (63%) compared to Palestinians and the favorability rating of Israel remains high (67%) compared to the Palestinian Authority. Republicans have significantly increased their support for Israelis (85%), but Democratic support remains low at 48 percent. In a second report that compares Americans’ rating of a wide list of countries, Canada is most favored, and Iran, North Korea and the Palestinian Authority the least. Israel is in a second tier of nations with India, France and Egypt. President Barack Obama’s approval rating has dropped below 50 percent as he begins his latest and possibly last effort to pass health care. The survey was conducted the week (Feb. 15-21) of the health care summit and Obama’s introduction of his own plan. The likelihood he can sell his health care plan with his own popularity is slim. In fact, his approval rating among independents hasn’t been above 50 percent since August when health care became so controversial. Obama has told Democrats that they should vote on health care and let the voters decide the issue in November. Unfortunately, he’s of no help to Democrats.